My German coffee cake recipe, aka Kaffeekuchen, is a delicious way to learn how to make coffee cake. With nuts and cinnamon, it's fun to make with the kids. They just love to lick the bowl! Because of its ease and deliciousness, this is one of those easy dessert ideas that you'll return to time and time again. Delicious served with whipped cream, but ice cream would be nice as well. 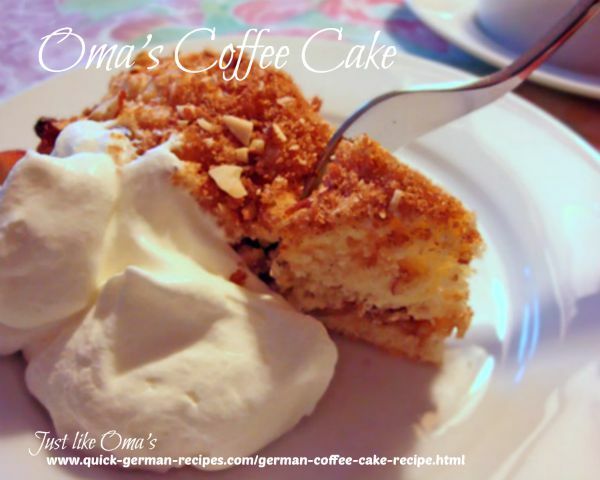 Oma's German Coffee Cake. Perfect for Kaffeeklatsch! Greased a 9" square baking pan. In mixing bowl, beat butter, sugar, and extract until creamy. Blend flour and baking powder together. Stir flour mixture alternately with the milk into the sugar mixture. Spread half of batter in greased pan. Combine nuts, brown sugar, and cinnamon. Sprinkle half over batter in pan. Carefully top with remaining batter and sprinkle with remaining nut mixture. Bake 30 - 35 minutes until wooden pick inserted in center comes out clean. Blend powdered sugar and milk to make glaze. Drizzle over cooled coffeecake. Quick to make, this coffee cake is a good one for beginners. 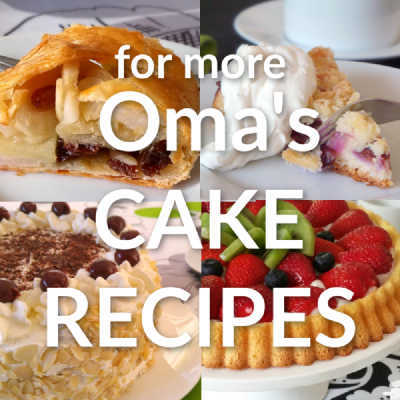 Master this easy method and you are well on your way to creating quick and easy cakes. You can easily alter this German coffee cake recipe by omitting the cinnamon and/or adding raisins. I added a half cup of raisins to the nut/sugar mixture. Of course, I used almond extract, our favorite :-) It was delicious served with whipped cream. Ice cream would be nice as well, but plain is also good. This method of mixing the butter, sugar and eggs first and then alternately adding the flour and liquid is a simple version of the German "rührteig" (translated as "stir dough"). HINT: For this cake, I wet my hands with water to help smooth the dough.